Book a detox at the Park Hyatt Dubai, which has three- or five-day packages with accommodation, a daily healthy breakfast, daily body treatments at Dubai Herbal Treatment Centre and Amara Spa and a food menu from the Viva Mayr Clinic in Austria. Call 04-6021234. Rugby match, Force vs Lions, screened at 2pm at McGettigan’s, JLT and DWTC. Will and Jaden Smith explore our post-apocalyptic planet in After Earth; Jesse Eisenberg and Isla Fisher mix magic and money in Now You See Me; Terrific father-son trio Dharmendra, Sunny and Bobby Deol re-unite for the sequel of 2011 hit comedy in Yamla Pagla Deewana 2. 100 years of Bollywood, a concert at Crowne Plaza Dubai, from 9pm; tickets Dh100-350. Performers include Sa Re Ga Ma Pa winner Hrishikesh Ranade, Jitendra Abhyankar and Priyanka Barve. MORE Café starts its summer 2013 photography competition, with the theme ‘Your UAE Story in Four Images’. Open to all UAE residents aged 13+ in two age categories. The teen winner (13–17) will receive a Leica V-Lux40 camera and the adult (18+) category winner will receive a Nikon D7000 Kit with 18-105mm lens. Upload their photos atgulfphotoplus.com/more before September 13 with a 150-word story about the images. Best entries will be exhibited in October for public judging, with winners announced in November. Dubai Rock Fest, with performances from Yngwie Malmsteen, Epica, Dark Tranquillity and the UAE’s Anuryzm, at Dubai World Trade Centre; tickets Dh250-450 at mpremiere.com. Last night of Elvis Forever, a tribute to the King of Rock ‘n’ Roll, playing hits spanning the ’50s, ’60s and ’70s, at Madinat Theatre. Shows June 6–8; tickets Dh195 at Madinat Theatre box office. Have a snorkel in Atlantis’ aquarium, now open for swimmers to join the 65,000 marine animals in The Ambassador Lagoon. Dh225 per person, with a free snorkel and mask. Expect to see Golden Trevallys, Cobias, Crescent Angelfish, sharks and rays. Call 04-4261000. It’s the final episode of Game of Thrones season 3. The hourlong finale is at 11pm on OSN First HD. Indulge, a food and fashion event at La Postreria, Souk Al Bahar, 11am-8pm. Clothes include cotton tunics, playsuits, embroidered dresses, shorts, alongside summer cooking demos all day. Personalized three-course lunch menu Dh99 a head. Last chance to catch Time of Transformation, an exhibition of hand painted silver gelatin photographs by Youssef Nabil, at The Third Line Gallery, closing on June 12. Cirque Le Soir’s Déjà vu Billionaire Affair: Want to meet “real desi billionaires”? Head to this new party at the Fairmont Dubai nightspot. Table bookings on 050-9764027; couples can enter for free. At the movies: Happy birthday, Superman! The Man Of Steel is back, in time for his 75th birthday, and he looks as good as ever (well, Henry Cavill does, anyway). Clin Firth plays a character who appears ordinary to the point of boring in indie drama Arthur Newman; Vince Vaught and Owen Wilson will hopefully bring their Wedding Crashers comedy to The Intership; relative newcomers Pulkit Samrat and Manjot Singh star in the awkwardly-titled comedy Fukrey. Björn Again perform at Ritz-Carlton, DIFC, Dubai; tickets Dh295 at Platinumlist.ae. Tere Ghar Ke Samne, a play in Hindi starring Kashmira Shah, Rajesh Puri, and standup comedian Krushna, at Shaikh Rashid Auditorium, Indian High School, Dubai. Tickets Dh75-350; call 04-3373724/050-6549100/050-8465959. Taal, a concert with “Jai Ho” singer Sukhwinder Singh, and playback star Alka Yagnik at Shaikh Rashid Hall, Dubai World Trade Centre. Tickets Dh100-1,000; call 050-2254010 or 04–43337606/07. Dubai Flea Market moves inside at Dubai World Trade Centre for the summer (from July-Sept, every first Friday of the month). At Zabeel Hall 3, 2-7pm, entry Dh5. Sellers fee Dh300, register at dubai-fleamarket.com. Dance workshop, featuring Indian classical and Bollywood, at Mayavi Dance Studio, Karama, Dubai, 3-5pm. Register at info@woman2woman.bizto enroll. Dad O-limpics Day at Caboodle (also June 16) with father/daughter and father/son games, including barefoot Lego gauntlet, build the tallest tower challenge, arts and crafts and a daddy parenting skills quiz. Dh85, includes two-hour playtime for one child and a cup of tea for Dad. Visit A Verse Imprinted: Islamic Art, a calligraphy exhibition until August 31 at The Ara Gallery, Downtown Dubai, in collaboration with the Dubai Arabic Calligraphy Centre. Made a film? Sharjah International Children’s Film Festival has extended the date of film submissions to June 20. There are two categories for submissions: Films made by children and young adults, and films made for children, for the festival in October. How to Catch a Star, a live show based on the Oliver Jeffers picture book, aimed at Children from 3-7 years old at Madinat Jumeirah Theatre. Morning and afternoon performances June 19-22; tickets Dh135; call 04-3666546. At the movies: Can Brad Pitt save the world; more importantly, can he save World War Z, predicted to be summer’s biggest flop? Find out today. Also releasing: See how Manny and Lou started out in Monsters University; Kolaveri Di singer Dhanush makes his Bollywood entry with Sonam Kapoor in romance Raanjhanaa; After their Cannes showcase, Ameesha Patel and Neil Nitin Mukesh release Shortcut Romeo. Punchline Comedy Club with Owen O’Neill, Tim Clark and Eddie Brimson at Emirates Golf Club, Dubai. (Also at The Clubhouse, Abu Dhabi, June 21; Hilton Al Ain, June 26; Jumeirah Creekside Hotel, June 27; Sharjah Rugby Club, June 28.) All shows start at 9pm; tickets Dh200 (Emirates Golf Course and Abu Dhabi Clubhouse); Dh150 (Creekside and Sharjah Rugby Club and Hilton Al Ain, at urbanevents.ae. Dubai Sports World, an indoor summer sports event opens at Dubai World Trade Centre, bigger than ever, until August 21. It’s open seven days a week, 8am-midnight (3am in Ramadan). To book a space, call 04-3064000 or visitdubaisportsworld.ae. Violinist Dani Vi plays at Cavalli Club, Dubai. Be Super Natural Workshop by Haley Mac of raw vegan food company Be Super Natural, 10.30am-12.30pm at Bo House Café, Dh90, includes two-hour super food talk and refreshments; email info@bohousecafe.com. The Wayans brothers, Shawn and Marlon, play their second night of stand-up comedy at Dubai World Trade Centre (also June 21), tickets Dh290; call 04-3237445. Modhesh World is open! 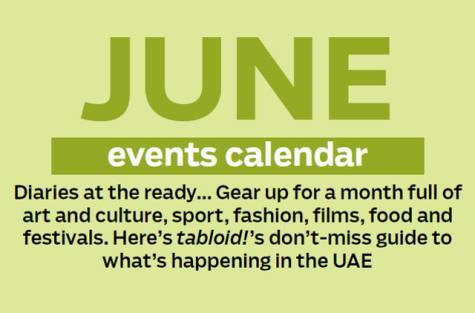 The fun starts at Dubai International Convention and Exhibition Centre from June 20. It’s lobster night at Sofra bld, Shangri-La Hotel, Qaryat Al Beri, Abu Dhabi. All-you-can-eat lobster, crustaceans and types of fish, 7-11pm. Dhs199++ per person including soft drinks. Call 02-5098888. See No.10, Rana Begum’s third solo show in Dubai, exhibiting metal sculptures coated with vibrant colours, at the Third Line, from June 19-July 30. Wednesday is Thrive Industry Night at Sublime, Ibis World Trade Centre Dubai, with live music by Chronicles of Khan, tunes from DJs Rob Turner and Krunkmaster DJ Silk. At the movies: The Dirty Picture pair Vidya Balan and Emraan Hashmi re-unite for a comedy about two ex-cons who are married to each other in Ghanchakkar; Channing Tatum must save US president Jamie Foxx in White House Down. SummerFest Abu Dhabi starts, running until August 17 at Adnec and du Forum on Yas Island, with edutainment, shows, Arabic concerts, comedy nights, theatre and sport. Fun includes a live-action Cartoon Network Village, Lego zone, and the Lazy Town live show until July 3. Dh40 for adults and Dh20 for under-12s. ; kids under two enter free. Yas Waterworld Abu Dhabi ladies night extended timings, from 5-10pm every Thursday evening, Dh210 (those over 1.1m) and Dh170. Men are not be admitted to the park; boys eight years old and under will be allowed access with female relatives on production of a photo ID or birth certificate as proof of age. Mid-summer Christmas at Yalumba, with festive dishes including roast turkey, Christmas pudding, Yule log, gingerbread house, Dh499 per person at Le Meridien Dubai; call 04-7022455. Head to Maya – Modern Mexican Kitchen + Lounge, at the Le Royal Meridien Dubai, for its Mas Mas Maya brunch (also Fridays) serving up family-style. Mexican food from 1-4pm with access to the hotel’s beach and pools 9am-6pm and 20 per cent off on selected beverages between 5-7pm in the rooftop lounge. Dh350 (Dh450 with selected beverages; kids menu for 12 and above, Dh150). Last day to see Pioneers of Indian Modernism, an exhibition of works by Indian artists such as MF Husain, VS Gaitonde, SH Raza, Tyeb Mehta, Ram Kumar, and Akbar Padamsee, at Sovereign Gallery; call 04-4322846. Relocation in Dubai (UAE). Migration to Dubai is in mold. For very a few years the city Dubai has been a standout amongst the most alluring locales (from an expense perspective) to move to.